Choose a square and click on it. Click on the matching words in the box that appears. If you are right the picture is replaced by an X. Continue until you have won four squares in a row. Match pictures to texts to win 4 cells in a row from a grid of 20 cells. 4 in a row is a simple game of naming 4 cells in a row. 4 in a row started as a game to play on paper called "Noughts and crosses". 4 in a row is ideally suited to learning in pairs, taking turns to name a cell. 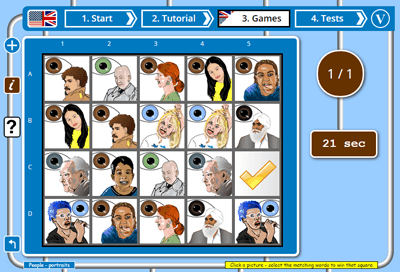 You should learn your chosen topic using our English lessons before playing 4 in a row. You claim a picture by clicking on it then choosing the word or sentence that matches it. Your row can be horizontal, vertical or diagonal. When you get 4 in a row you win the game (obviously). Select "4 in a row" on the English games selection page. Take a quick look at the method text for 4 in a row. Click on PLAY to to proceed, or change your topic with the CHANGE TOPIC button. On the play page you have a grid of 20 pictures (each topic picture is shown twice for beginner topics). Click on a picture cell - the topic vocabulary will appear as a list beside the picture. Roll over any text to play the English audio for that text. Click the text that corresponds to the picture. If you are correct, the picture will be replaced by a blue X - otherwise, a wrong sound will play. Continue matching pictures to their vocabulary until you have completed a line of 4 cells. The line can be diagonal as well as horizontal or vertical. 4 crosses in a row wins the game and the "game over" animation will play. Choose an option from the green sign, or click on games to choose a different game.